A different version of this planter is available here. To make this self watering container I used two plastic totes and a sturdy, plastic colander. One tote will be cut down to act as a water reservoir, the other tote will hold the soil and the colander will be used as a wicking chamber to draw water from the water reservoir into the soil above. 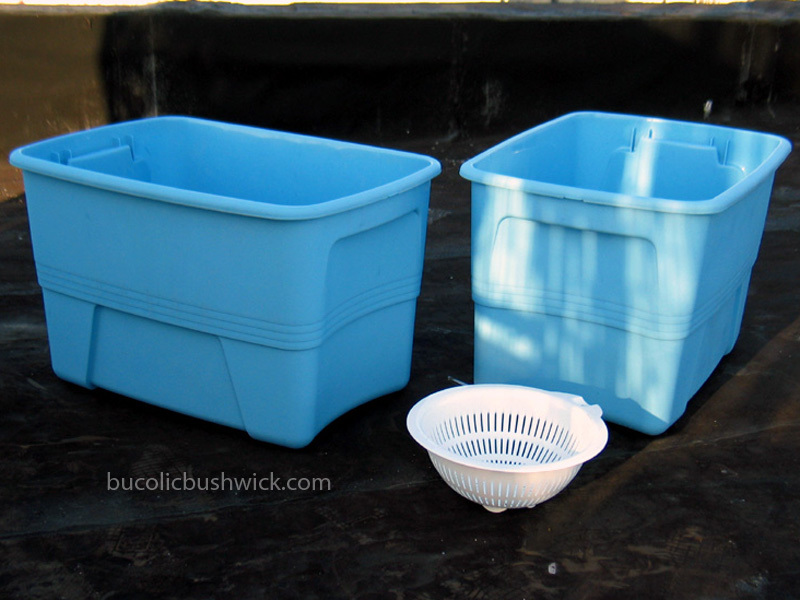 If you have lids for these totes save them for later use. 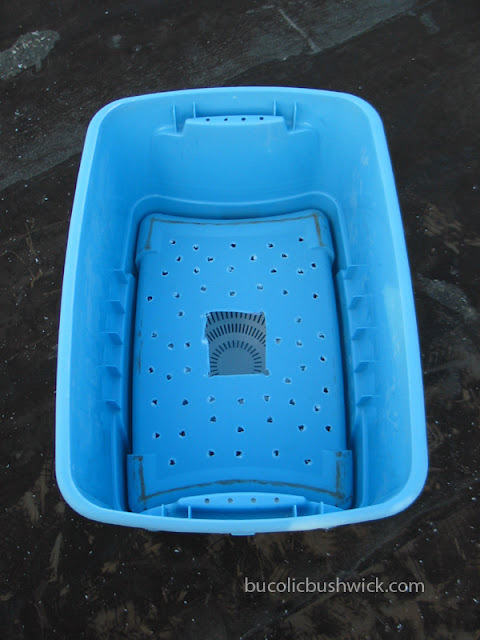 Cut one tote down to the height of the colander, then drill small 1/4" holes for soil aeration all over the bottom of this tote. In the center, cut an opening for the colander. Save the other half of the tote you cut down for later use. Place the colander inside the unaltered tote and then place the altered tote on top, bottom side up. Secure the colander to the altered tote, I used a couple of zip ties. Drill a large hole through the outer tote and inner tote to act as both the overflow hole and as the fill hole. Optional: If you don't want to bend down to fill the water reservoir you can add a fill tube to this design. Photos for a fill tube can be seen here. When you add soil to the container make sure it is firmly packed into the colander. The soil in the colander will connect the water in the reservoir to the soil chamber above it, so make this link as strong as possible. It helps to pre-moisten the soil before you add it to the colander. 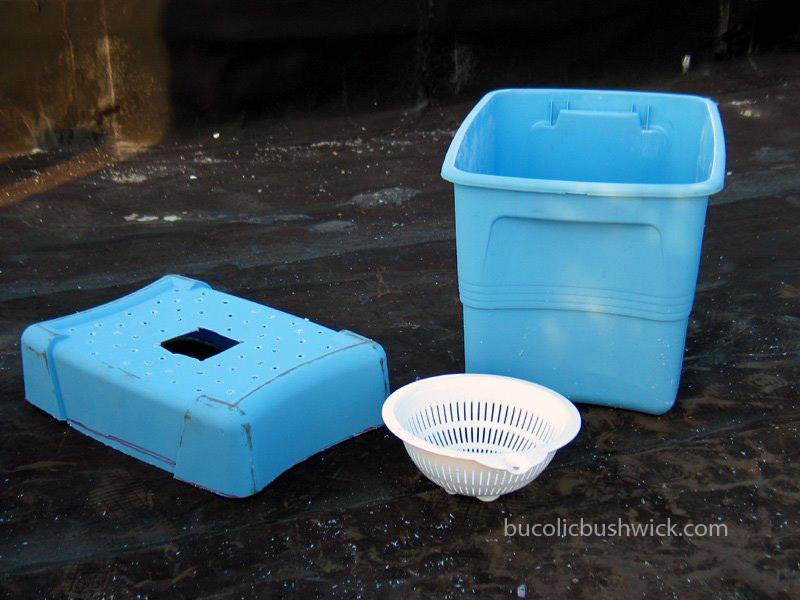 If you saved the unused portion of the cut down tote, and have a lid for it, you can also make a mini greenhouse/cold frame to go on top your self watering container. 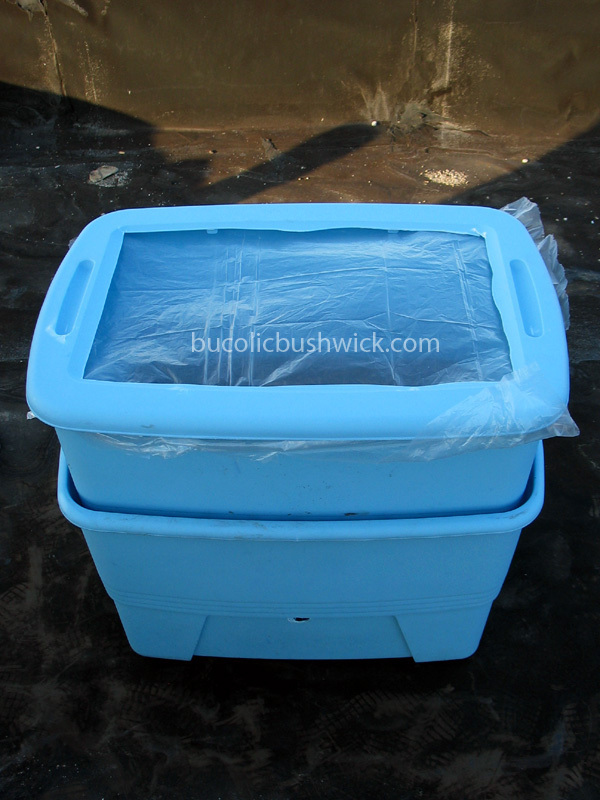 Simply cut a large opening into the lid and add a clear sheet of plastic between the lid and the tote. Voila! Self watering container plus mini green house all for under $11. I have a couple extra bell pepper seedlings I could plant, but I have more than enough in other containers so I bought some broccoli seedlings at the Union Square Green Market. The container could use more soil, but I am not buying anymore this year so that's that. This is a great idea. I especially like the idea of using the remainder as a hot cap. Very creative and practical! Nice job! I wish I had found blue containers for mine. Much nicer than gray. Did you put fertilizer around the rim of yours? I've been having trouble with my dumb pooch ripping off the fabric to get to the fertilizer. It's organic so it probably smells like bones or something. Hi Jackie & Maggie, glad you liked it! Hi Stacy, I buried the fertilizer. I dug a shallow trench right down the middle of the container, about 1" deep, filled it with fertilizer and then covered it up with soil. I doubt that would hide it from a dog though. The gardening bug always gets me around this time of year too. This is when I start browsing through seed catalogs or plant something indoors. Happy new year! I'm wanting to do this for an after school program I am teaching, and we only meet once a month. Do you think we can make this and it be self sustaining for the month? Also, what kind of light would you recommend we use? I would be concerned about the water supply running out before the month is over. A weekly or bi-weekly check should solve that problem. Florescent lights or compact florescent lights that glow a cool blue are what I use when growing indoors. Hope your project works out! When I say cool blue light I'm referring to bulbs that have a 5500k or 6500k color temperature. They're often marketed as daylight bulbs. That helps a lot! Thank you! I looked into the blue lights, which are much cheaper than I expected (YAY!) I hope all goes well! I'l let you know! Thank you so much! This is so awesome. Thanks for sharing. I'd like to know your estimate of how many vegetables could fit in this container. Hi Colett, it would depend on what you would like to grow and where it's growing. As an example, one the roof I only put 1 tomato plant in the container. At ground level I would consider putting 2. For peppers, 4 on the roof, 6 on the ground. It all depends on the water demands of the chosen plant and the quality of the growing environment. Hope this helps! Do you happen to know if any of the chemicals that make the plastic are able to leach into the food when the plastic reacts with the heat of the sun? I contacted the manufacturer of the tote I am planning to use and they said it does not contain BPA, however, they don't recommend using these totes for food storage as they have not been tested for food storage. Hi Tara,I recall reading somewhere to look at the recycling number on container. Certain numbers are ok for food growing, others are not. If I find the link I'll post it here. Thank you so much! I just found out that the container I am using a Sterlite tote is a number 5 which is food safe. The manufacturer also replied to me stating that it does not contain BPA! Woohoo! In case anyone else has the same question! I think a layer of coffee filters about 3 or 4 layers thick would be nice in the colander before you add the wet soil. If it prevents the soil from migrating into the water reservoir the soil will remain firmly packed. Will not work very well because if the large hole in the middle where the dirt will fall in. As you ad water later it will wash the dirt away from the hole eventually filling most of the water reservoir with soggy dirt and make mud. 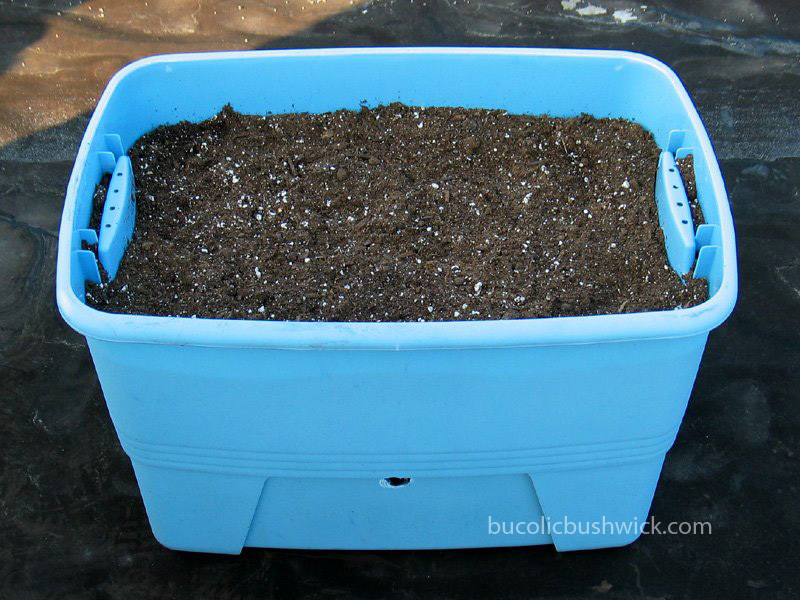 If that is the case the you could just do away the the bottom tray and fill the container with water directly to keep the soil wet. The only way this would work is if you did not make a large hole in the center but make 4 slits , 2 on each end and then run 2 strips of synthetic cloth that will not degrade from one slit into the other making sure your cloth strips hit the bottom of the reservoir. The cloth soaks up the water to the soil keeping it moist and not soggy and the dirt will not clog up your reservoir. Hi Todd, you should check out my other self watering containers. They've abandoned the soil as wicking chamber concept and use cloth strips instead.